Citrus Park, Florida is an unincorporated part of eastern Hillsborough County about 15 miles northwest of downtown Tampa, or a 15 minute drive north of Tampa International Airport along the Veterans Expressway. The area was very rural and sparsely populated until the construction of the Citrus Park Mall in the late 1990s. Since the opening of the mall, Citrus Park has experienced rapid commercial and residential growth, making it a new, up-and-coming part of the Tampa Bay Area. If you're looking for a Citrus Park pool builder to make your back yard into a beautiful Citrus Park outdoor living space for you and your family, we'd like you to consider Grand Vista Pools. 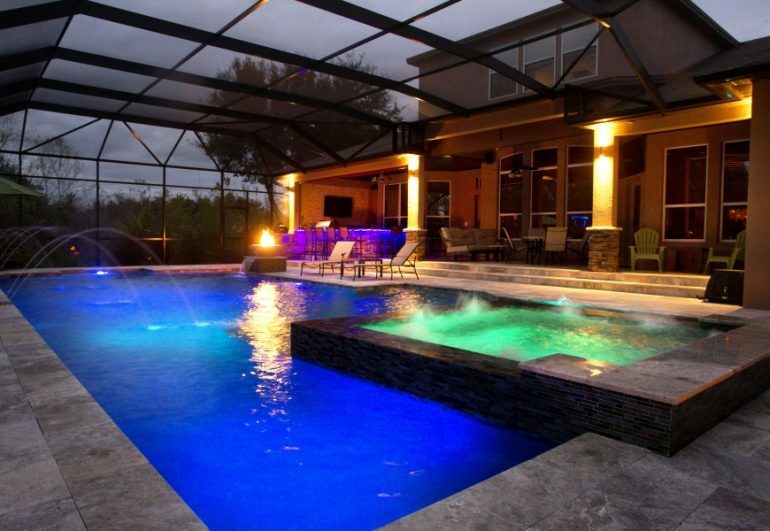 We've been building new swimming pools in Citrus Park, Florida and the surrounding area for decades. One of the things that makes Grand Vista Pools special is not only are we an experienced pool builder, but we're also a licensed general contractor. This means we can design and build your entire outdoor living space including making renovations to your home to help help your indoor living space and outdoor living space flow together. Do you have an older Citrus Park swimming pool that needs remodeling? Grand Vista Pools can help you with that. We do everything from basic pool resurfacing to extreme makeovers of pools. Want to add a hot tub? A waterfall? Lighting or fire features? We can do that. Grand Vista Pools also a lot of experience designing and building Citrus Park outdoor kitchens. If you can dream it, we can make it happen - from an amazing outdoor grill to a fantastic full-featured kitchen to a relaxing outdoor bar. Give us a call, and let's discuss your outdoor living ideas.